I worked on finishing up the bootees and hat this weekend. I love how the cables look! I started the hat on Friday night, but ran out of Nature Spun and had to buy one more skein yesterday. 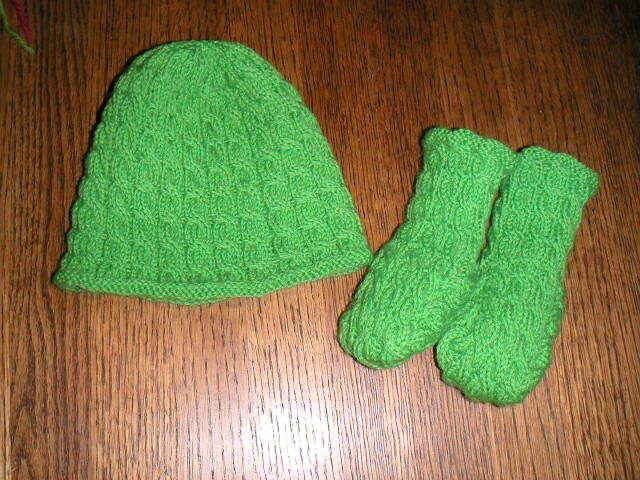 So, it only took a bit over a skein to make the hat and the bootees. I also got my Elann order on Friday. The dusty teal was more like a bright blue, but I still like the color combination. I'll probably start swatching for the Ribby Cardi this week, between hats and scarves.